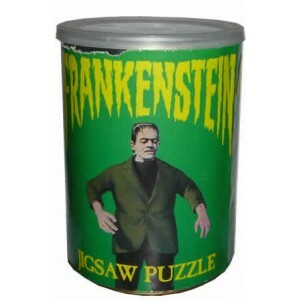 Jigsaw puzzles in a can were cool in the late 1970s. Today I was walking around our local Publix grocery store and spotted corn chips in a can. Something about the size and style of the can, brought back a '70s flashback. Yes, I thought of Planters Cheez Balls, but I remember being very young and playing with puzzles that came in a can. There was something cool about the way the puzzle pieces came in a coffee type can. You would seal the can with a plastic lid, just like a coffee can. The can made the puzzles super portable and I could take them to Grandma's or a friend's house. Most of these 1970s jigsaw puzzles in a can were made by APC American Publishing Corporation. Is anyone old enough to remember these? APC American Publishing Corp. made puzzles in cans. Huge 6 Million Dollar man fan!! You could do a year's worth of blog post on those toys!!! Never saw those, as I can recall, and I was born near the 70s. I'm old enough but I don't remember. Guess I never had much patience for puzzles. Don't remember the jigsaws in a can at all...but the Six Million Dollar Man was my hero. I have one around here that I never allowed myself to open. My MIL gave it to us back in the 70's, but it wasn't a superhero.